Our heavy duty, industrial tipping skip forklift attachments come in a wide range of sizes and capacities and are a cost effective means of moving waste material around the worksite. Each tipping skip has a hopper body made of 3mm or 5mm steel with folded top edges and a heavy-duty, easy-action handle, complete with safety catch. There's a one-way entry base frame as standard, although a three-way entry frame is also available. 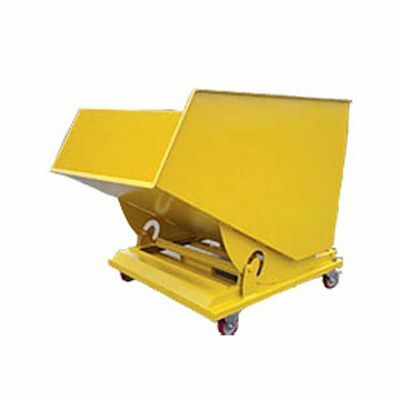 These industrial tipping skips are supplied in yellow as standard, although blue and green versions are also available. There's a wide range of other optional tipping skip accessories, such as castors, lifting lugs and steel lids available separately. Our Sales team will be more than happy to help you if you need more information, so why not give them a call on 01332 821200?